It has now been more than one year since the horrific destruction of the WTC towers in New York City. The Empire State Building is now the tallest building in NYC. This is a scaled claim which will pay based on the date on which a building is dedicated or officially open for occupancy (whichever comes first) in NYC which is taller than the current height of ESB (1250 ft). Any future change in the height of the ESB will have no effect upon this claim. 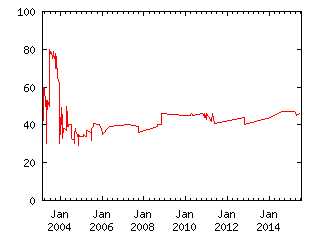 The payout would be given by the formula: ((year completed - 2003) x 4) + [Jan|Feb|Mar=0; Apr|May|Jun=1; Jul|Aug|Sep=2; Oct|Nov|Dec=3]. The official arbiter for the height of any buildings will be the Council on Tall Buildings and Urban Habitat. Should this council no longer exist at some point in the future, it will be the judges duty to find an equally reputable successor. The criteria for how the height of a building is measured is given here. UPDATE: Here is the current website for the Council on Tall Buildings and Urban Habitat. (9/11/06). View the ticker for this Claim. Back to my account page.